This article is about the vine. For the tree, see Crescentia and Crescentia cujete. For other uses, see Calabash (disambiguation). Not to be confused with Calabaza. A calabash, bottle gourd, or white-flowered gourd, Lagenaria siceraria, also known by many other names, including long melon, New Guinea bean and Tasmania bean, is a vine grown for its fruit, which can be either harvested young to be consumed as a vegetable, or harvested mature to be dried and used as a utensil. When it is fresh, the fruit has a light green smooth skin and white flesh. Calabash fruits have a variety of shapes: they can be huge and rounded, small and bottle shaped, or slim and serpentine, and they can grow to be over a metre long. Rounder varieties are typically called calabash gourds. The gourd was one of the world's first cultivated plants grown not primarily for food, but for use as containers. The bottle gourd may have been carried from Africa to Asia, Europe, and the Americas in the course of human migration, or by seeds floating across the oceans inside the gourd. It has been proven to have existed in the New World prior to the arrival of Christopher Columbus. Because bottle gourds are also called "calabashes", they are sometimes confused with the hard, hollow fruits of the unrelated calabash tree, Crescentia cujete, whose fruits are also used to make utensils, containers, and musical instruments. 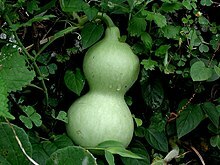 The bottle gourd is a commonly cultivated plant in tropical and subtropical areas of the world, now believed by some to have spread or originated from wild populations in southern Africa. Stands of L. siceraria, which may be source plants and not merely domesticated stands, were reported in Zimbabwe in 2004. This apparent domestication source plant produces thinner-walled fruit that, when dried, would not endure the rigors of use on long journeys as a water container. Today's gourd may owe its tough, waterproof wall to selection pressures over its long history of domestication. Gourds were cultivated in Africa, Asia, Europe, and the Americas for thousands of years before Columbus' discovery of the Americas. Historically, in Europe Walahfrid Strabo (808–849), abbot and poet from Reichenau and advisor to the Carolingian kings, discussed the gourd in his Hortulus as one of the 23 plants of an ideal garden. Recent research indicates that some gourds have an African origin and that there were at least two unrelated domestications: one is thought to have occurred 8,000-9,000 years ago, based on the analysis of archeological samples found in Asia. The second domestication is believed to have occurred 4,000 years ago, and has been traced from archeological discoveries in Egypt. The mystery of the bottle gourd —– namely that this African or Eurasian species was being grown in the Americas over 8,000 years ago —– comes from the difficulty in understanding how it arrived in the Americas. The bottle gourd was originally thought to have drifted across the Atlantic Ocean from Africa to North and South America, but genetic research on archeological samples published by the National Academy of Sciences in December 2005 suggested that it may have been domesticated earlier than food crops and livestock and, like dogs, was brought into the New World at the end of the ice age by the native Paleo-Indians. This study showed that gourds in American archaeological finds appeared to be closer to Asian variants than to African ones. In February 2014, the original hypothesis was revived based on a more thorough genetic study. Researchers more completely examined the plastid genomes of a broad sample of bottle gourds, and concluded that North and South American specimens were most closely related to wild African variants and could have drifted over the ocean several or many times, as long as 10,000 years ago. Nowadays, bottle gourds are grown by direct sowing of seeds or transplanting 15- to 20-day-old seedlings. The plant prefers well-drained, moist, rich soil. It requires plenty of moisture in the growing season and a warm, sunny position, sheltered from the wind. It can be cultivated in small places such as in a pot, and allowed to spread on a trellis or roof. In rural areas, many houses with thatched roofs are covered with the gourd vines. Bottle gourds grow very rapidly and their stems can reach a length of 9 m in the summer, so they need a solid support along the stem if they are to climb a pole or trellis. If planted under a tall tree, the vine may grow up to the top of the tree. To obtain more fruit, farmers sometimes cut off the tip of the vine when it has grown to 6–8 feet in length. This forces the plant to produce side branches that soon bear flowers and yield more fruit. The plant produces white flowers. The male flowers have long peduncles and the females have short ones with an ovary in the shape of the fruit. Sometimes the female flowers drop off without growing into a gourd due to the failure of pollination if there is no bee activity in the garden area. Hand pollination can be used to solve the problem. Crops are ready for harvest within two months; yield ranges from 35–40 m tons/ha. Like other members of the Cucurbitaceae family, gourds contain cucurbitacins that are known to be cytotoxic at a high concentration. The tetracyclic triterpenoid cucurbitacins present in fruits and vegetables of the cucumber family are responsible for the bitter taste, and could cause stomach ulcers. In extreme cases, people have died from drinking the juice of gourds. The toxic cases are usually due to the gourd being used to make juice, which the drinkers described as being unusually bitter. In three of the lethal cases, the victims were all diabetics in their 50s and 60s. However, in June 2018 a healthy woman in her early 40s was hospitalized for severe reactions after consuming the juice and died three days later from complications. However, the plant is not normally toxic when eaten and is safe to consume. The excessively bitter (and toxic) gourds are due to improper storage (temperature swings or high temperature) and over-ripening. Do not mix the juice of gourds with other juices, such as that of bitter gourd, so as not to mask the taste if it has gone bad. In Central America, the seeds of the bottle gourd are toasted and ground with other ingredients (including rice, cinnamon, and allspice) to make the drink horchata. (The calabash tree, Crescentia cujete, is known locally as morro or jícaro; it is another type of "calabash"). In Colombia and Venezuela, the calabash tree is known as a taparo or totumo (it is also another kind of "calabash" plant). The calabash is frequently used in southern Chinese cuisine in either a stir-fry dish or a soup. The Chinese name for this plant is 葫蘆 (Traditional script) or 葫芦 (Simplified script). The pronunciation of this Chinese word depends on region. In Japan, the species is known as hyōtan (瓢箪, 瓢簞) or yūgao (夕顔), with the former word referring particularly to the larger-fruiting variety whose fruits are used mostly for making containers or other handicrafts, and the latter referring to the smaller-fruiting variety whose fruits are more edible. Names that have been used to refer particularly to the fruit of one or another variety of this species include hisago (瓠, 匏, 瓢, ひさご) and fukube (瓠, 瓢, ふくべ), the former referring especially to a gourd used as a scoop and the latter referring especially to a gourd used as a bottle, though both these words are somewhat antiquated in the Japanese language of the present day. It is most commonly sold in the form of dried, marinated strips known as kanpyō and is commonly used as an ingredient for making makizushi (rolled sushi). In Korea, both the plant and its fruit are known as bak (박). Traditionally, the inner flesh has been eaten as namul vegetable and the outside cut in half to make bowls. Both fresh and dried flesh of bak is used in Korean cuisine. Fresh calabash flesh, scraped out, deseeded, salted and squeezed to draw out moisture, is called baksok. Scraped and sun-dried calabash flesh, called bak-goji, is usually soaked before being stir-fried. Soaked bak-goji is often simmered in sauce or stir-fried before being added to japchae and gimbap. Sometimes, uncooked raw baksok is seasoned to make saengchae. In Burma, this calabash is known as ဗူးသီး boo thee, a popular fruit; young leaves are also boiled and eaten with a spicy hot, fermented fish sauce called nga peet. It can also be cut up, coated in batter and deep fried to make fritters, which are eaten with Burmese mohinga. In the Philippines, it is often cooked with pork, sotanghon noodles are often added too. This is usually added on top of rice for extra nutrients. In Vietnam, bầu (opo squash), bầu canh, or bầu nậm is a very popular vegetable, commonly cooked in soup with shrimp, meatballs, clams, various fish like freshwater catfish or snakehead fish, or crab. Opo squash is also commonly stir-fried with meat or seafood, or incorporated as an ingredient of a hotpot. It is also usd as a medicine. A popular north Indian dish is lauki channa, (channa dal and diced gourd in a semi-dry gravy). In the state of Maharashtra in India, a preparation similar to lauki channa is popular. However, the skin is removed prior to making the dish and used in making a dry spicy chutney preparation. In Assam, it is consumed with fish curries, as boiled vegetable curry and also fried with potato and tomatoes. Lauki ka kheer (Grated Bottle gourd, sugar and milk preparation) is a hearty dessert from Telangana,usually relished during occasions. In Bangladesh, the fruit is called lau লাউ or in the Chittagong and Sylhet region kodu [কদু] or xodu [খদু] and is served with rice as a common dish. In Nepal, in the Madheshi southern plains, it is called lauka (लौका). Preparations other than as a normal vegetable include halwa and khichdi. In Pakistan, the calabash is known as kaddu [کدو]or lauki [لوکی] in Urdu, and kaddu [کدو]in Punjabi and Pashto. The plant is cultivated on a large scale as its fruit is a popular vegetable. In traditional medicine, the fruit is considered to have cardiotonic with anti-hyperglycemic an antilipidemic properties. The claims are supported by recent research. The fruit also has remarkable antioxidant activities which have been demonstrated in a number of studies. 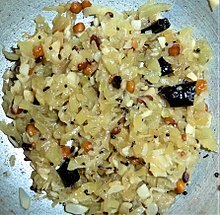 In Sri Lanka, it is used in combination with rice to make a variety of milk rice (labu Kiribath, ලබු කිරිබත්), which is one of the popular native dishes among Sri Lankans. In Arabic, it is called qara. In Aramaic, it is called kura. In the Talmudic period, the young fruits were boiled, whilst the mature fruits were eaten as dessert. The tender young gourd is cooked as a summer squash. It is believed that this plant was consumed by Prophet Jonah after he was spat out by the Whale. In Italian cuisine, the fruit is known as cucuzza (plural cucuzze). Hollowed-out and dried calabashes are a very typical utensil in households across West Africa. They are used to clean rice, carry water, and as food containers. Smaller sizes are used as bowls to drink palm wine. Calabashes are used in making the West African kora (a harp-lute), xalam/ngoni (a lute) and the goje (a traditional fiddle). They also serve as resonators underneath the balafon (West African marimba). The calabash is also used in making the shegureh (a Sierra Leonean women's rattle) and balangi (a Sierra Leonean type of balafon) musical instruments. Sometimes, large calabashes are simply hollowed, dried, and used as percussion instruments, especially by Fulani, Songhai, Gur-speaking and Hausa peoples. In Nigeria, the calabash has been used to meet a law requiring the wearing of a helmet on a motorcycle. In South Africa, it is commonly used as a drinking vessel and a vessel for carrying food by all tribes such as Sepedi and IsiZulu tribes. Erbore tribe children in Ethiopia wear hats made from the calabash to protect them from the sun. Recently, the Soccer City stadium which hosted the FIFA World Cup has been completed and its shape takes inspiration from the calabash. The Malian kora player Toumani Diabaté with his instrument. A calabash is primarily used to make utensils such as cups, bowls, and basins in rural areas. It can be used for carrying water, or for transporting fish, when fishing. In some Caribbean countries, it is worked, painted, and decorated and turned into shoulder bags or other items by artisans, and sold to tourists. As a cup, bowl, or even a water-pipe or "bong", the calabash is considered consistent with the "Ital" or vital lifestyle of not using refined products such as table salt, or modern cooking methods, such as microwave ovens. In Haiti, the plant is called kalbas kouran, literally, "running calabash", and is used to make the sacred rattle emblematic of the Vodou priesthood, called an asson. As such, the plant is highly respected. It is also the national tree of St. Lucia. Note that "guacal" in Costa Rica refers to C. cujete tree calabash. The Costa Rican town of Santa Bárbara de Santa Cruz holds a traditional annual dance of the calabashes (baile de los guacales). Since 2000, the activity has been considered of cultural interest to the community, and all participants receive a hand-painted calabash vessel to thank them for their economic contribution (which they paid in the form of an entrance ticket). Aboriginals throughout the country traditionally serve chicha in calabash vessels to the participants of special events such as the baile de los diablitos (dance of the little fiends). In Hawaii, a calabash is a large serving bowl, usually made from a hardwood rather than from the calabash gourd, used on a buffet table or in the middle of the dining table. The use of the calabash in Hawaii has led to terms like "calabash family" or "calabash cousins", indicating an extended family grown up around shared meals and close friendships. This gourd is often dried when ripe and used as a percussion instrument called an ipu heke in contemporary and ancient hula. The calabash is used as a resonator in many string instruments in India. Instruments that look like guitars are made of wood, but can have a calabash resonator at the end of the strings table, called toomba. The sitar, the surbahar, the tanpura (south of India, tambura north of India), may have a toomba. In some cases, the toomba may not be functional, but if the instrument is large, it is retained because of its balance function, which is the case of the Saraswati veena. Other instruments like rudra veena and vichitra veena have two large calabash resonators at both ends of the strings table. The Baul singers of Bengal have musical instruments made out of calabash. The practice is also common among Buddhist and Jain sages. These toombas are made of dried calabash gourds, using special cultivars that were originally imported from Africa and Madagascar. They are mostly grown in Bengal and near Miraj, Maharashtra. These gourds are valuable items and they are carefully tended; for example, they are sometimes given injections to stop worms and insects from making holes in them while they are drying. Saraswati veena, the calabash resonator is not always functional but it is kept in place because of the balancing effect. Rudra veena is a large plucked string instrument used in Hindustani classical music. One of the major types of veena played in Indian classical music, it has two calabash gourd resonators. The vichitra veena, also with two large resonators, is a similar instrument. The tambura or tanpura may have a toomba (although not in this picture), a resonator made of calabash at the end of the strings table. Hindu ascetics (sadhu) traditionally use a dried gourd vessel called the kamandalu. The juice of a bottle gourd is considered to have medicinal properties and be very healthy. In parts of India, a dried, unpunctured gourd is used as a float (called surai-kuduvai in Tamil) to help people learn to swim in rural areas. In many rural parts of Mexico, the calabash is dried and carved hollow to create a bule or a guaje, a gourd used to carry water around like a canteen. The gourd cut in half, called jícara, gave the parallel name to a clay cup jícara. In Brazil, Chile, Argentina, Uruguay, and Paraguay, calabash gourds are dried and carved into mates (Quichua word, adopted in Spanish language), the traditional container for mate, the popular caffeinated, tea-like drink brewed from the yerba mate plant (the container is called cuia, porongo, or cabaça in Brazil). In the same region, it is called mate as is also the calabash from which the drinking vessels are made, and, in Peru, (where the practice of drinking mate is not adopted,) it is used in a popular practice for the making of mate burilado; "burilado" is the technique adopted for decorating the mate calabashes. In Brazil, gourds also commonly used as the resonator for the berimbau, the signature instrument of capoeira, a martial art/dance developed in Brazilian plantations by African slaves. The calabash gourd is possibly mankind's oldest instrument resonator. Mate carved and decorated as a drinking container (also called mate, and the infusion also called mate). Berimbau, musical instrument in Brazil: The gourd functions as a resonator. In the region where Incas lived (Peru, Bolivia, Ecuador), calabash gourds are known to have been used for medicinal purposes for over a thousand years by Andean cultures. The Inca culture applied folklore symbology to gourds to pass down from one generation to another, and this practice is still familiar and valued. Bowls made of calabash were used by indigenous Brazilians as utensils made to serve food, and the practice is still retained in some remote areas of Brazil (originally by populations of various ethnicities, origins and regions, but nowadays mainly the indigenes themselves). Note that "totuma" refers to the vessel made of C. cujete calabash. Former president Hugo Chávez of Venezuela suggested Venezuelans avoid showers longer than three minutes. Critics of Chavez ridiculed this by reductio ad absurdum, suggesting the use of a totuma to bathe (although Chavez himself did not suggest this), inferring that people have to bathe with "a totuma of water", the quantity of water that only one totuma can hold. It is a joke because it exaggerates the original words, because a totuma is a device that carries very little quantity of water, not enough for bathing (not even to get wet). The gourd can be dried and used to smoke pipe tobacco. According to American consular reports from the early 20th century calabash pipes were commonly used in South Africa. Calabash was said to bestow a "special softness" of flavor that could not be duplicated by other materials. The lining was made of meerschaum, though tin was used for low-grade models. A typical design yielded by this squash is recognized (theatrically) as the pipe of Sherlock Holmes, but Doyle never mentioned Holmes using a calabash pipe. It was the preferred pipe for stage actors portraying Holmes, because they could balance this pipe better than other styles while delivering their lines. See, Smoking pipe (tobacco)#Calabash. ^ "Lagenaria siceraria". Natural Resources Conservation Service PLANTS Database. USDA. Retrieved 22 January 2016. ^ "BSBI List 2007". Botanical Society of Britain and Ireland. Archived from the original (xls) on 25 January 2015. Retrieved 2014-10-17. ^ "Ingredient Spotlight: Cucuzza ("Googootz")". ^ a b Erickson, D. L; Smith, B. D; Clarke, A. C; Sandweiss, D. H; Tuross, N (2005). "An Asian origin for a 10,000-year-old domesticated plant in the Americas". Proceedings of the National Academy of Sciences. 102 (51): 18315–20. doi:10.1073/pnas.0509279102. PMC 1311910. PMID 16352716. ^ "Cucurbitaceae--Fruits for Peons, Pilgrims, and Pharaohs". University of California at Los Angeles. Archived from the original on 16 October 2013. Retrieved 2 September 2013. ^ See Sally Price, "When is a calabash not a calabash" (New West Indian Guide 56:69-82, 1982). ^ Decker-Walters, Deena S; Wilkins-Ellert, Mary; Chung, Sang-Min; Staub, Jack E (2004). "Discovery and Genetic Assessment of Wild Bottle Gourd [Lagenaria Siceraria (Mol.) Standley; Cucurbitaceae] from Zimbabwe". Economic Botany. 58 (4): 501–8. doi:10.1663/0013-0001(2004)058[0501:DAGAOW]2.0.CO;2. JSTOR 4256864. ^ Clarke, Andrew C; Burtenshaw, Michael K; McLenachan, Patricia A; Erickson, David L; Penny, David (2006). "Reconstructing the Origins and Dispersal of the Polynesian Bottle Gourd (Lagenaria siceraria)". Molecular Biology and Evolution. 23 (5): 893–900. doi:10.1093/molbev/msj092. PMID 16401685. ^ Gemüse des Jahres 2002: Der Flaschenkürbis (in German). Schandelah: VEN – Verein zur Erhaltung der Nutzpflanzen Vielfalt e.V. 2002. Archived from the original on 10 August 2007. Retrieved 14 July 2010. ^ Strabo, Walahfrid (2000). De cultura hortorum (in Latin and German). Näf, W.; és Gabathuler, M. (ford.). ISBN 978-3-7995-3504-5. Archived from the original on 29 September 2007. Retrieved 14 July 2010. ^ Walahfrid Strabo (2002). De cultura hortorum sive Hortulus VII Cucurbita (in Latin). Fachhochschule Augsburg: bibliotheca Augustana. ^ White, Nancy (2005). Nancy White University of South Florida – South American Archaeology: Archaic, Preceramic, Sedentism. Bloomington: Indiana University Bloomington MATRIX project. ^ "Transoceanic drift and the domestication of African bottle gourds in the Americas", Kistler et al, Proceedings of the National Academy of Sciences, February 10, 2014. ^ Adhyaru-Majithia, Priya (13 March 2010). "Not all bitter veggies are good, they can kill you: Doctors". DNA. Bhaskar Group. Archived from the original on 9 July 2010. Retrieved 9 July 2010. ^ Chandra, Neetu (9 July 2010). "Toxin in lauki kills diabetic city scientist". India Today. Living Media. Archived from the original on 9 July 2010. Retrieved 9 July 2010. ^ "Bitter 'lauki' juice can kill you". Times of india. Living Media. 28 June 2011. Retrieved 28 June 2010. ^ "Pune woman dies after drinking bottle gourd juice - Times of India". The Times of India. Retrieved 7 July 2018. ^ Jeong, Jaehoon (14 September 2016). "[정재훈의 밥상 공부] 광해군이 먹고 감탄해 벼슬까지 내린 잡채는?" [[Jeong Jaehoon's dining table study] What japchae impressed Gwanghaegun so much that he gave it a title of a public official?]. ChosunBiz (in Korean). Retrieved 15 December 2016. ^ 김, 민지 (14 March 2012). "냄비우동·박고지김밥…"5000원의 행복 맛보러 오세요"" [Naembi udong, bakgoji gimbap... "Come to taste the happiness of 5,000 won]. Gyeongnam Domin Ilbo (in Korean). ^ Maqsood, Maria; Ahmed, Dildar; Atique, Iqra; Malik, Wajeeha (2017). "Lipase inhibitory activity of Lagenaria siceraria fruit as a strategy to treat obesity". Asian Pacific Journal of Tropical Medicine. 10 (3): 305–310. doi:10.1016/j.apjtm.2017.03.010. PMID 28442115. ^ Ahmed, Dildar; Fatima, Munim; Saeed, Sana (2014). "Phenolic and flavonoid contents and anti-oxidative potential of epicarp and mesocarp of Lagenaria siceraria fruit: A comparative study". Asian Pacific Journal of Tropical Medicine. 7: S249–55. doi:10.1016/S1995-7645(14)60241-8. PMID 25312131. ^ image at Joseph Opala Archived 18 May 2008 at the Wayback Machine, "Origin of the Gullah", yale.edu. ^ "Nigeria bikers' vegetable helmets". BBC News. 6 January 2009. ^ "Baile del Guacal" [Dance of the Calabash]. La Nación (in Spanish). 1 July 2010. ^ Parrales, Freddy (29 January 2011). "Rey Curré se encendió con el baile de los diablitos" [Rey Curré was ignited with the dance of the little fiends]. La Nación (in Spanish). ^ Landsberg, Steven. "The History of an Indian Musical Instrument Maker". ^ "Ashok Pathak - Surbahar". ^ "No more singing in the shower: Chavez urges Venezuelans to limit their wash to three minutes amid water shortages". Daily Mail. London. 22 October 2009. ^ La totuma endógena | Artículos Laureano Márquez. Laureanomarquez.com. Retrieved on 2013-08-16. ^ "Daily Consular and Trade Reports". Wikimedia Commons has media related to Lagenaria siceraria. Brief discussion of the species, uses, ecology, and etymology of generic and specific names. Lagenaria siceraria in West African plants – A Photo Guide.